Festive and spicy--great all year long! Wonderful with all types of cheese- cheddar, havarti, goat, and more! a little something spicy for your festive turkey dinners! Great as an hors d'oeuvre and more! 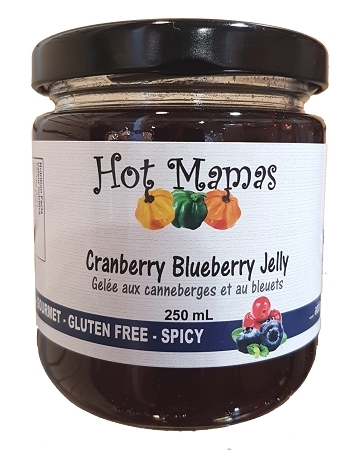 Made with fresh cranberries from Bala, Ontario and wild blueberries. Ingredients: Sugar, water, cranberries, blueberries, scotch bonnet peppers, pectin.